While many of us are celebrating Easter Monday with family and friends, enjoying the last of the hot cross buns, we are reminded that one hundred years ago today final arrangements were being made to prepare Titanic for its maiden voyage. The RMS Titanic was a British registered four funneled (only 3 worked, the other was for show) ocean liner built for the transatlantic passenger and mail service between Southampton and New York. There are many stories surfacing this week in the news about Titanic. There is also plenty to see in Prime Time. 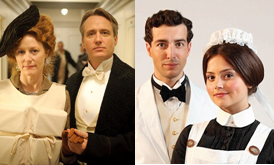 In Canada, CBC produced the docu-drama Waking the Titanic (click to view the video); The Miami Herald has a great list of the many different Titanic-based offerings. As a fan of Julian Fellowes’ work I was excited at the privilege of being part of the first audience to view his new mini-series Titanic 2012. The four part series has been broadcast as separate one hour installments in Canada on Wednesdays, and in the UK on Sunday nights. ABC is planning to air 3 episodes April 14th, and I believe we all get to see the finale on the 15th. I found the 1st episode served up as a disappointing first course, the 2nd slightly better, but the 3rd course more enjoyable. So, to those of you in the US, enjoy seeing the series back to back, I think that is the way it was intended to be shown. I echo the sentiments in yesterday’s Huffington Post article; stories of 1st and 2nd class passengers are not as interesting as the ones presented from 3rd class and crew. A budding romance between an Italian steward and stewardess is far more entertaining than the stuffy upstairs relationship of Lord and Lady Manton or 2nd class bantering Batleys. Then there’s the mysterious Peter Lubov, the cop killer who boarded Titanic to escape his past. Will foul play follow him? Would you Like Your Poultry Small, Medium or Large? With time running out and still a few more dishes to blog about from the 1st, 2nd and 3rd class (steerage) menus, I will be doing some grouping these final few days. Titanic carried 25,000 lbs of poultry and game on board. We have already prepared curried chicken and chicken lyonnaise. 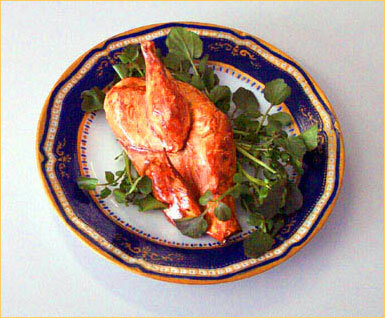 Today we will focus on the roasted poultry dishes. In 1st class Duck was offered as a main entree choice, while squab held its own as the seventh course. In 2nd class, diners enjoyed turkey as part of their choice of main dish. On Titanic all the birds would have already been cleaned. At Downton, if this game brought down during a shoot, poor Daisy would have been responsible for plucking and cleaning…a scullery maid’s work is never done. Squab was served at the seventh course in 1st class. You can substitute any small bird such as partridge or Cornish game hens. Rinse and pat dry squab, inside and out. In bowl, mix together oil, garlic, marjoram, salt and pepper. Rub over squab, inside and out. Truss and secure bacon slice over each squab breast. Place in roasting pan and cook in 450°F oven for 15-20 minutes or until juices run pink. Remove and discard bacon and broil for 2-3 minutes or until well browned. Remove from pan; tent with foil and let rest for 10 minutes. Place roasting pan over high heat. Stir in Madeira, red wine and chicken stock. Bring to boil, stirring to scrape up any brown bits; cook for 7-8 minutes or until reduced to about 1/2 cup. Strain and keep warm. Watercress: In large pot heat 2 tbsp of the walnut oil over medium heat. Add garlic and cook, stirring for 2 minutes; increase heat to high and add damp watercress. Cook, stirring for 1 minute or until wilted. Toss with lemon juice, salt, pepper and remaining walnut oil. To serve: Make a nest of watercress on heated platter; halve each squab, removing backbone and arrange over top; serve with sauce on the side. While Roast Chicken wasn’t on the final menus, I thought I would tuck this link to my favorite chicken recipe in case you want to try something a little less ambitious, but still in the spirit of Titanic. Remove giblets and neck from duck, rinse and pat dry inside and out. Trim excess fat from both ends of cavity. In small bowl, stir together thyme, salt and pepper, rub all over duck, inside and out. Place shallots and apple inside cavity. Using poultry pins or basting needle, truss cavity closed. Twist wing tips behind back. Place duck, breast side up on rack in large roasting pan. Roast in 425°F oven for 20 minutes. Shield breast meat with foil, reduce heat to 350°F and bake for 1 hour or until instant-read meat thermometer registers 180°F when inserted into leg. Place on heated platter. Set roasting pan on stove over medium-high heat; skim off fat. Stir in chicken stock and Calvados. Bring to boil, stirring to scape up any brown bits. Boil for 5 minutes or until reduced to ½ cup. Stir in sugar and continue to cook for 3-5 minutes or until slightly syrupy. Pour into heatproof bowl. Return duck to roasting pan; remove foil and brush with half the glaze. Bake in 350°F oven for 5 minutes and brush with remaining glaze. Roast for 20 minutes longer. Increase heat to 475°F and cook for 5 minutes or until skin is well browned and crisp. Remove to heated platter, tent with foil and let rest for 20 minutes. While duck is resting, prepare the applesauce. In a heavy-bottomed saucepan, heat the vegetable oil over medium heat. Add the shallots and saute 5 minutes or until they are softened. Sprinkle the sugar over the shallots and continue sauteing them, stirring often, for 5 minutes or until shallots are well browned and very soft. Stir in the cider vinegar and apples. Reduce heat slightly. Cover and cook 7-8 minutes or until apples are tender. Mash mixture until smooth and serve with duck. 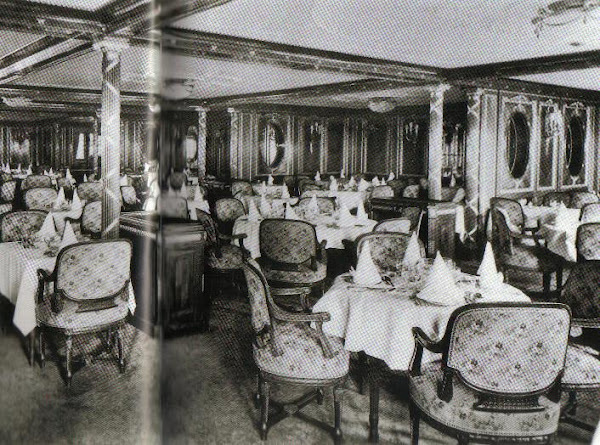 Meanwhile in 2nd Class, passengers were enjoying turkey as part of the main course selection. Turkey had increasingly become popular as a festive dish, which had replaced goose on the Christmas table by the early 20th century. If you would like to host a Titanic Dinner without too much fuss, a turkey dinner will still make it a special occasion. Since turkey is a dish many cooks should be familiar with, I offer a link to my favorite source for cooking, Fine Cooking whose goal is to teach the science of cooking. They have a number of turkey recipes which I have used over the years, which should suit your skill level and preferred preparation technique. 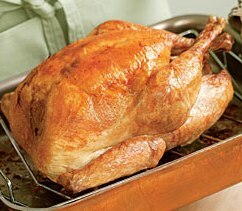 They also have great how to videos, and this great article on how to keep your turkey moist. Dana McCauley has a interesting twist on traditional cranberry sauce, and definately better than the canned version. In a small saucepan, heat oil over medium heat; stir in onion and garlic and cook, stirring occasionally, for 5 minutes or until softened. Stir in port and balsamic vinegar; boil for 5 minutes or until reduced to about 3 tbsp. Meanwhile, stir together cranberries, sugar, salt and pepper. Mix into onion mixture; bring to boil and cook, stirring often for about 8 to 1 minutes or until cranberries are tender and sauce is thick. You can store in a non-metallic container in your refrigerator, tightly covered, for up to 1 week or in freezer for up to 1 month. What a beautiful group of recipes. 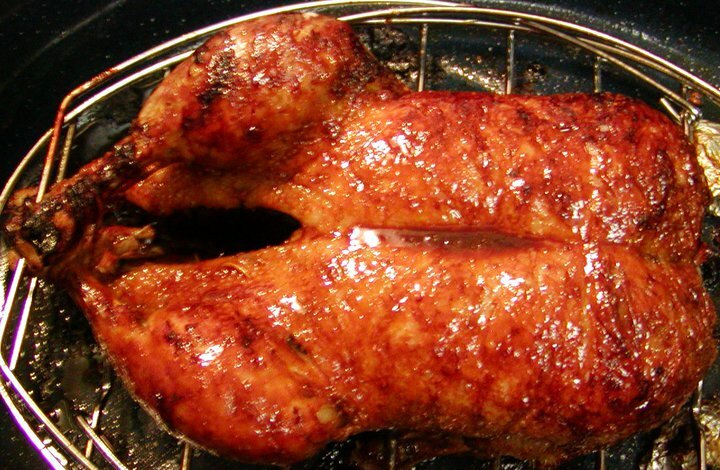 Who could resist a duck glazed with Calvados? We are fast approaching our Titanic dinner on Saturday and my friend Angela and I are quite excited. I made the pâté yesterday and will make the shrimp butter tonight, both will do well sitting for a day or two to really get the flavours going. I’ve never been a fan of the small birds, too bony and picky for my taste.